The first release of 2013 is actually the last data from 2012. In general, last quarter, radio listening had fallen a bit – a combination of the summer and the Olympics. Television did well, which in turn meant that radio suffered. Did listening bounce back in Q4? Yes it did. Overall, 90% of UK adults (15+) listened to the radio during the average week in Q4, listening for 1.04 billion hours. This listening was up a bit on Q3 – up 1.4%. But that additional listening was certainly weighted towards the BBC – with the BBC extending its lead over commercial radio to 55.3% versus 42.3%. The big RAJAR story was always going to be a question of how Nick Grimshaw performed in his first RAJAR outing. Chris Moyles’ departure was undoubtedly a major move for Radio 1, and his replacement’s show is very different to Moyles. For a starter, he plays music. On the surface, Grimshaw has done well – only losing 0.6% of his audience compared with Moyles’ final quarter. I think most people expected the audience to drop. Part of the reason for Grimshaw taking over was to shift the age of Radio 1 listeners downwards. There was concern that they were getting a bit too old. So maintaining the vast majority of Moyles’ audience means he’s done surprisingly well. Dig a little deeper, however, and you’ll find that the amount of time spent listening to Radio 1’s breakfast show has dropped markedly – down 17.2% on the previous quarter. Perhaps this is because Moyles’ lengthy spoken bits of the show meant that you had to stay listening to him. On the other hand, if you play records, there’s an excuse for you to stop listening and do whatever you needed to next. Listening hours are more important to commercial radio than the BBC, so I suspect both groups will be happy with these results. And the average age of Radio 1 breakfast listeners has fallen – just a bit, but it’s downwards. The overall station has dropped it’s average age yet, but it’s early days. On the other hand, commercial radio heads certainly won’t be happy with Radio 2. It’s achieved new record audiences for both reach and hours. It now has over 15m listeners a week, and 183m hours. That’s a lot of listeners and listening. To put that in perspective, 17.6% of all radio listening is to Radio 2. Also at the BBC, 6 Music did very well, also achieving record highs for reach and hours. It now reaches nearly 1.9m listeners (whisper it, but that’s only just behind Radio 3). Not bad for a station that very nearly closed down. I think it’s also worth mentioning that my own employer did rather well this quarter. The Absolute Radio Network now reaches 3.3m listeners, a record for the Absolute Radio brand, and an eleven year high for the business. These particular gains are built around substantial gains for the main Absolute Radio station. After some excellent Q2 2012 results, Q3 was something of a disappointment, and these results see it return to its previous level. Elsewhere Talksport and Classic FM were broadly flat in reach, with the former gaining hours (up 5% on the quarter) and the latter losing some (down 7% on the quarter). Radio 4 and Five Live were broadly speaking unchanged with just nominal changes in audience. Radio 3 lost some reach (down 4%) but was fairly flat in listening hours. In London, Magic is still the most listened to commercial station in terms of reach and hours, although it saw a 7% drop in reach, and 20% fall in hours. The reason it maintained its number one status is because its competitors including Kiss, Capital and Heart all also saw falls in reach and hours to one extent or another. Kiss suffered the most, losing 26% of its hours in the quarter. The significant gains in commercial radio in London were made by Absolute Radio, Smooth and Xfm. Digital listening reached its highest ever level, with 33.0% of all listening being via a digital device. Later this year, the industry will await with keen interest the decision of the Secretary of State for Culture, Media and Sport on any future switchover. We’ll have to wait to see what she says, and while there’s still a way to go to get to the 50% that has been widely talked about, steady growth continues to be made. And 54% of people listen to a digital platform every week. The growth in digital listening is coming from every platform, but the biggest growth this quarter has come in internet listening. This has now reached 4.9% of all listening. In other words, nearly one in every twenty hours of internet listening is via the internet. Given the ongoing growth of smartphones and tablets, and the significant investment radio groups have put into mobile apps perhaps suggests this growth. Different stations are obviously “more” or “less” digital. Absolute Radio, for example, is 55% digital, while Radio 1 lags at only 22.8% of its listening on a digital platform. Radio 3, on the other hand, is 34% digital while Five Live has just past 40% for the first time with 42% of its listening digital. And it’s worth noting that Absolute Radio’s internet listening is now 11.6%. This perhaps reflects the reduced advertising load internet listeners hear in return for registering. But don’t use this version, click through to the large version, where you can also read important notes about how to use it and shortcomings of the chart. 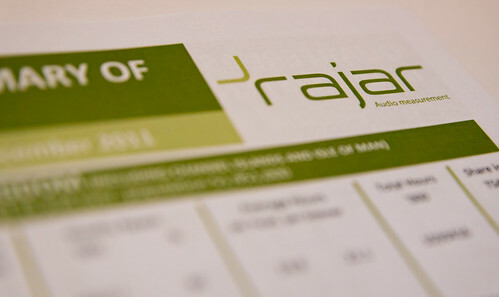 For more RAJAR figures, visit the following sites for all your needs! Source: RAJAR/Ipsos-MORI/RSMB, period ending 16 December 2012, Adults 15+.